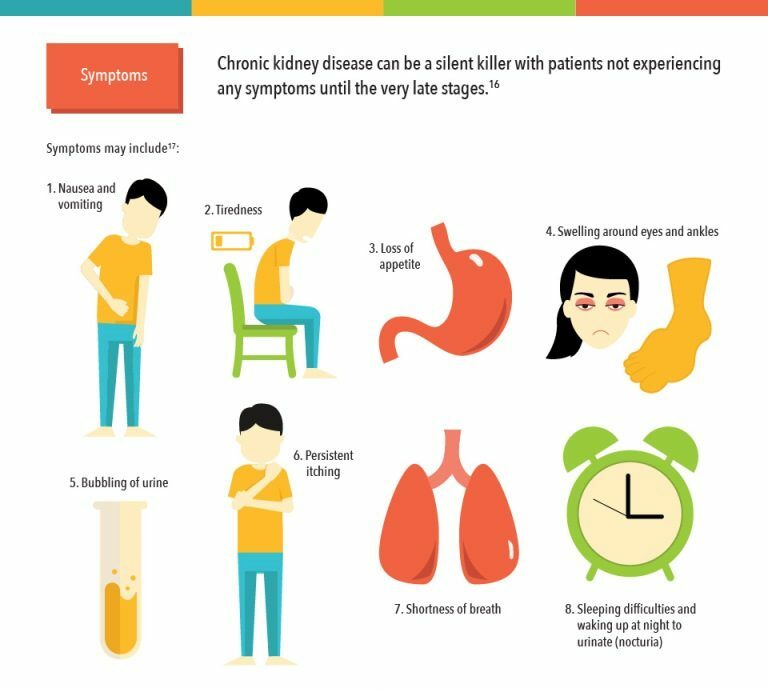 Kidney disease is often missed in people who have it, there are a number of symptoms but most people attribute them to other conditions, and by the time they feel them it is too late. Only ten percent of patients are aware that they are suffering from CKD. A person is at risk of CKD if they’re suffering from hypertension (high blood pressure), diabetes, or their family has a history of CKD. Another risk factor of CKD is age, as people over 60 should get tested each year. One symptom of CKD is changes in urination patterns, both in frequency and volume. Getting up multiple times a night to pee, or urinating blood is a sign that you might have CKD. Look out for bubbly or foamy urine, as this is an indication of protein in the urine. As kidney function declines an accumulation of toxins and impurities occurs in the bloodstream. High levels of these toxins in the bloodstream impact energy, alertness, and concentration. CKD can also cause anemia, which compounds weakness and fatigue felt by an accumulation of toxins. When the kidneys can no longer maintain a proper balance of minerals and nutrients, the skin becomes dry and itchy. Retaining sodium due to kidney function declining can lead to puffy eyes, and swelling of the legs and ankles. Kidney damage can also make food taste differently and cause bad breath. If found and treated early, chronic kidney disease is a manageable condition, but late diagnosis is serious and most likely leads to kidney failure. It is very important to keep an eye on the symptoms listed above, and talk to your doctor if you’re experiencing any of them.